Candy Corn is a controversial icon of Halloween. People seem to either love it or hate it. I like it as a treat, but I love it as a design element. Case in point: My love for the cheerful little kernels made me pounce on these vintage Fireking mugs by Anchor Hocking. Who wouldn’t love to sip some hot spiced cider or hot chocolate out of one of these mugs, while waiting for the next wave of giggling trick or treaters to make their way to the front door? At the thrift store, I see and pounce upon this inexpensive metal tray from England. "Look!" I say. "What a great tray! And it has FLOWERS!" Yes, it must be protected from scratches. But this is Just The Thing to place in the middle of the dining table, upon which to collect jars of condiments and what have you, to protect the tablecloth. 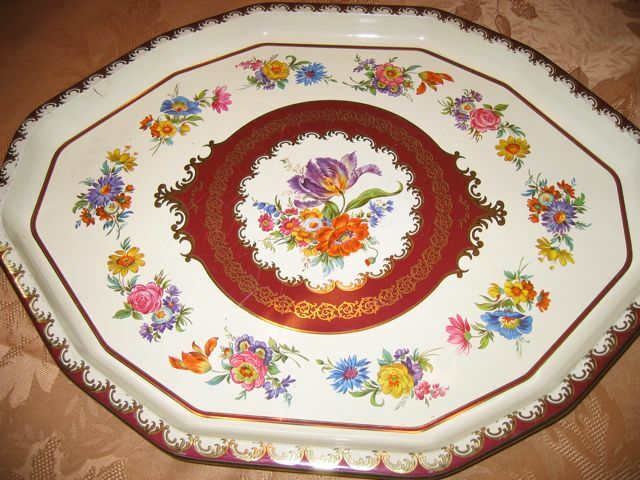 This one is fairly good sized, too, and could be useful in conveying tea or coffee to one's guests in the parlor. If one had a parlor. This item satisfies that wisdom from William Morris, "Have nothing in your house which you do not know to be useful, or believe to be beautiful." 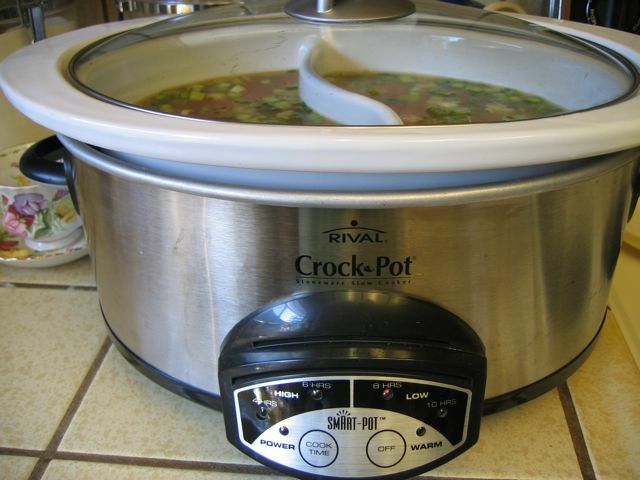 The first time I saw a divided slow-cooker crock, I thought it was silly. What a ridiculous waste of space! Fast forward to my current family food preferences, wherein I regularly cook for both a vegan and variously styled carnivores. When I saw this crock on sale at the local thrift shop for a mere seven dollars, I jumped on it! This is the large size crock pot by the "mother of all crock pot companies", Rival. I bought this model (with one UNdivided crock) for my now-vegan son Evan when he went away to college and shared a home and cooking duties with five house mates. 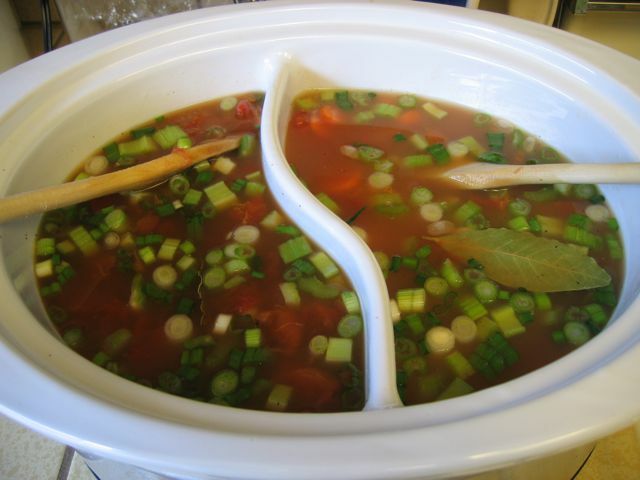 I regularly use my much smaller crock pot to make my standard and delicious chicken soup. (recipe forthcoming). But even though my vegan son Evan is happy to cook for himself, I wanted a way to use the crock pot for meals he would enjoy also. One day I experimented with cooking rice and lentils in the crock pot, and it was a success! But I was still left with the dilemma of "whom to cook for" when filling the crock pot. This clever divided crock solves the problem nicely. I was astounded to discover it holds twice the amount of my smaller crock! My cupboards are just as filled to over flowing with utensils as anyone else's, but this device is likely to earn its shelf space tonight when we all sit down to supper. Next post: The soup recipes! The pretty enameled iron cook pot you see pictured here was a lucky find at a thirft shop, where I picked it up for a mere $15 dollars last spring. I love this little casserole, also known as a "dutch oven". This is the one that convinced me that enameled cast iron cookware really is THE tool of choice when it comes to cooking up a pot of chili, stew or soup. It sautes, deglazes and dishes out an even heat like a dream, and can go from stove top to oven to table with ease. It is suitable for long slow cooking such as braising and roasting. It is also fairly easy to clean, although being used makes this one well past its prime in terms of appearance. The enamel on the edges of the pot are worn off and there is evidence of heavy use. Probably that's why I found it at the thrift store. The bottom of the pot is marked "Descoware" and "Made in Belgium". 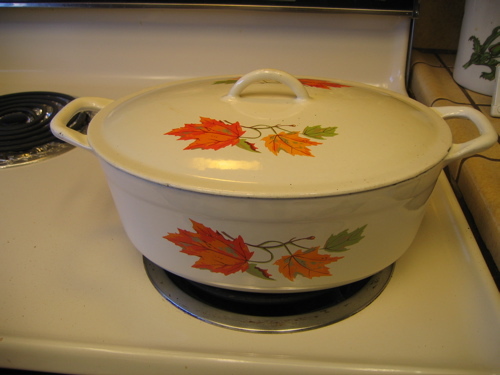 After a little searching on the internet, I learned that Descoware was made pre-1960s and was eventually bought out by Le Creuset, the makers of premier enameled cast iron cookware. 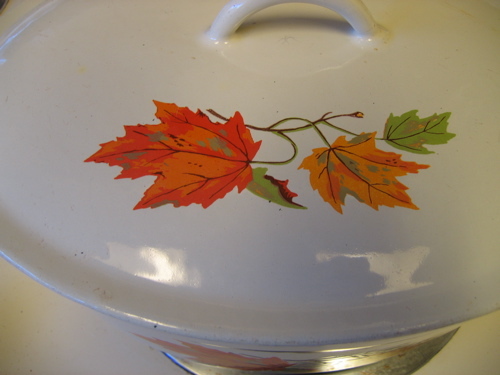 What I really like is the colorful autumn leaf pattern on the sides and lid! I thought it was unusual because of its oval shape. 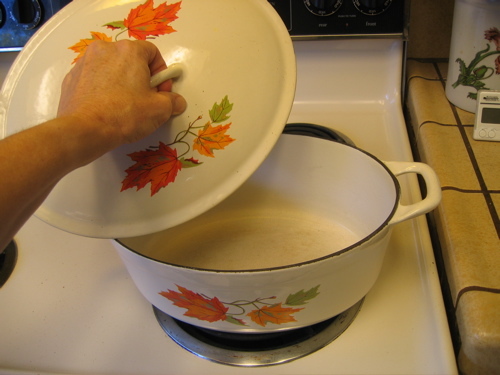 I have since learned that the oval shape is preferred for cooking a roast or small bird, as distinct from a round pot for sauces, stews, soups and the like. This particular pot would be for a very small roast, as it holds about 4 quarts of water almost to the brim. Because this kind of cookware is so expensive, I have thought long and hard about whether or not I really need another one, (answer: YES, and a bigger one too), and if so, which brand? Finally I have narrowed it down to two choices. Should I go with the investment in a modern Le Creuset 7 quart, round Dutch Oven in a bright and warm red color? Or should I go for the much less expensive 6 quart model in persimmon color that is sold under the Mario Batali name? As much as I love watching the Food network, I have also learned to be a bit cautious before investing in celebrity name cookware. When I bought my first and only piece of All-Clad, (a 14 inch pan that I LOVE), I considered purchasing the All-Clad pans with Emeril's name on them (dubbed with the kitchy title of "Emerilware", no less). In researching these pans I learned that the tri-ply construction that All-Clad is famous for is not as thorough in the Emerilware pieces. Yes, they are a lot less expensive, and that might be the best choice for someone who needs a full set of cookware. My strategy is to buy individual pieces, and I want it to be of the top quality I can afford. I have decided that my top choice, and the one that will go on my Christmas wish list this year, is the Le Creuset. This piece of cookware represents an investment in many years of future meals for my family and friends. Indeed, its size predicts more entertaining and food for a crowd. I like investing in that too. And someday, these pieces will be heirlooms for my two sons who are also learning their way around the kitchen. I love to cook, and I pride myself on keeping a fairly lean and gadget free kitchen. Nevertheless, there are some kitchen tools that are so handy, once you use them you will wonder how you got along without it. This past week I surveyed my kitchen and made note of my favorite kitchen tools that would make a great gift for the cooks in your home. Come back and visit for more ideas in the days ahead! Baking gear has gone 21st Century with the invention of the silicone baking mat, or Silpat. This flexible and reuseable baking mat replaces cooking parchment paper or grease on the baking sheet, saving money and calories. Even better, it works fantastically well, with an easy release of food with no sticking. Simply wash it with warm soapy water and dry it for the next time you bake. Amazing! I store mine by rolling it up in my favorite vintage kitchen linen. Do make sure you buy the size that fits your baking sheet. I love the Silpat, and I recommend purchasing two if you like to bake cookies and rotate the pans. There are also baking dishes and muffin pans now available in this same material. Recently I read that the best way to make coffee for the true coffee lover is with a French Coffee Press. Since my daily morning ritual includes two cups of coffee, I decided I had to check it out for myself. I bought a French press, put a few scoops of coffee inside, poured hot water over the grounds, and after a minute or two slowly depressed the plunger to separate the grounds from the coffee. The model linked to above is insulated, so your coffee will stay nice and hot. They are right; this method does produce a flavorful and markedly smoother cup of coffee! Apparently we Americans over-extract our coffee, which produces a more bitter brew. The European method of the coffee press is gaining favor here in the States as more people are discovering these little pots. I know, it's very unromantic to consider a mop kit as a gift item. But I love this mop. Let me tell you why. No one likes cleaning the kitchen floor, but this mop makes it quick and easy. The microfiber pads will hold three times as much water as conventional fabric. Simply wet the pad and place it on the floor, then press the mop head into the pad. The velcro makes it stick and you are ready to go! When you are done mopping, simply remove the pad and rinse it out or throw it in the washing machine. This mop system is like the popular "Swifer" brand mops--with one essential difference: The pads are reuseable! I don't know about you, but it kills me to consider using a mop with disposable liners. Our poor planet is already sufering under a load of wasteful garbage. And don't even get me started on the Swiifer mops that are battery operated! Puh-leeze! No thanks. This mop kit comes with the mop, and two pads--one for wet mopping and one for dusting. I recommend you buy an extra set of whichever type of pads you use most. I have a lot of tile flooring so I use two or three pads to go over the whole floor very quickly. I have used several types of floor mop, and this one is my favorite by far.